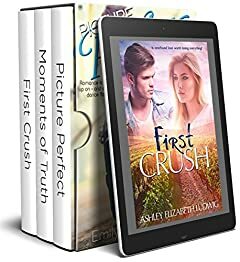 First Crush by Ashley Ludwig â€” For twenty-five years the Lakeview Slayer has left a trail of death in his wake. Now, he has Natalie in his sights. Nick Hardaway never recovered from his sisterâ€™s murderâ€”a victim of the Slayer years before. Determined to make amends for his sisterâ€™s death, he joins Natalie in her renovations of the chateau. Natalie and Nick may hold the key to capturing the Lakeview Slayer, but first the pair must decide if their love is worth dying for. Picture Perfect by Emily C. Reynolds â€” When they get thrown together for swing dance lessons, romance heats up onâ€”and offâ€”the dance floor. Moments of Truth by Sandra D. Bricker â€” Eight years, no kids ... she got the house.